Here's the modified Generation B flat that I just finished yesterday. It plays exactly how I want a whistle to play. 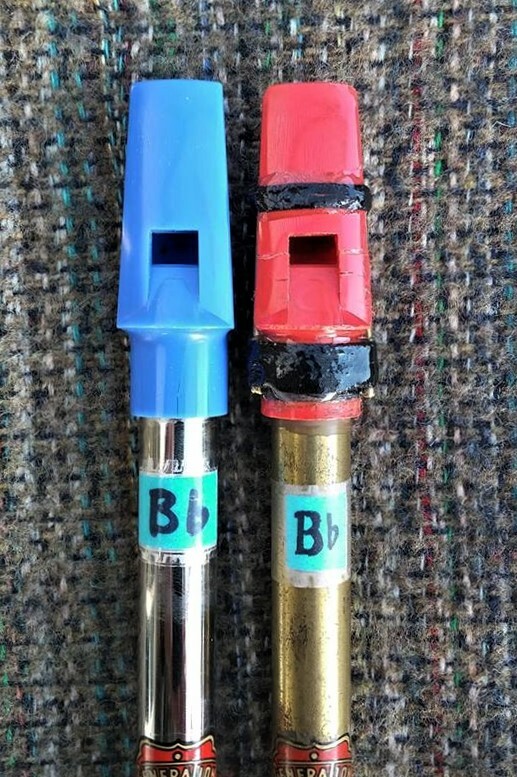 It's right in tune from the "bottom D" to "high B" (in D-whistle terms). The voicing is how I like it: full round low notes and extremely sweet easy high notes. I started with two old Generation B flats I happened to have. 1) in D-whistle terms, the E, G, A, B, and C were all in tune with each other, but the Bottom D and middle D were both quite flat. To solve this I chopped the bottom around 2mm. 2) in D-whistle terms, the F# was a hair flat so I carved out that hole. 3) As is common with Generations, the whole 2nd octave was a bit flat. To solve this I chopped the head in two, right through the window, and glued the head back together. There's a period where the glue is only partly set and you can move the pieces of the head around to get the voicing exactly how you want it, by the alignment of the blade and the windway. Left is a stock Generation Bb tube, on the right is the one I chopped and carved. 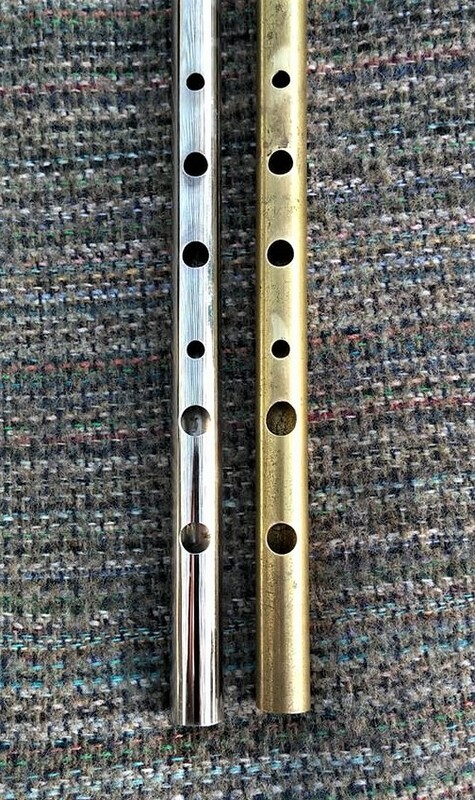 Left is a stock Generation Bb head, on the right is the one I chopped. Did that with epoxy-glue. Put some masking tape to cover the flue and the cutting edge, and dripped the epoxy with a small needle into the hole. I am a starting tin-whistler, and now it's easier to get the 2e octave. Just wonder why Dixon doesn't fill up that hole at fabrication. If I should deliver one of my native american flutes that way, I'd be out of bussiness. Thank you for posting that. I have to say that chopping the fipple in half looks like a recipe for trouble to me. How do you control how much you are reducing the opening? Is it just the width of the kerf on whatever you used to cut it? What are you using to glue it back together? A plastic solvent glue would soften the plastic and possibly mess up the windway. Super glue might not provide an airtight seal. Is that why it appears to be wrapped in some black material? It seems to me, with no experience in this area, that you could accomplish the same thing the way Freeman and O'Briain do, by gluing a pieces of plastic to the top of the blade and extending it past the stock blade edge.